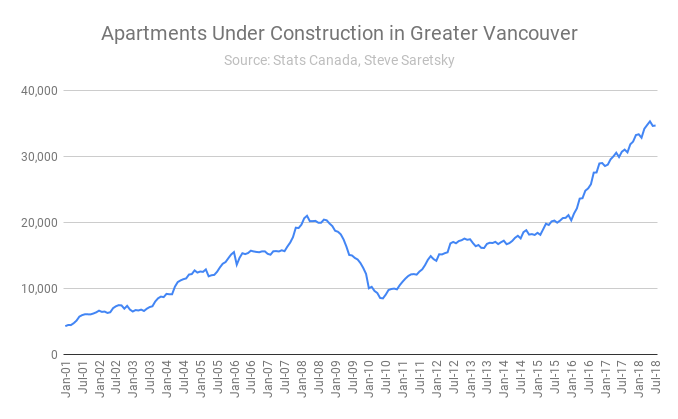 With home sales trickling in at an eighteen year low, and house flipping declining to a six year low, the Vancouver real estate market is becoming less liquid. In particular, and by design, the pre-sale market is exposed, and should be bracing for an uncomfortable landing. The pre-sale market in Vancouver is essentially selling futures contracts, although not marketed as such, they are defined as a legal agreement to buy or sell something at a predetermined price at a specified time in the future. While this has worked beautifully in recent years, it creates a recipe of problems in a declining market. Speculators who were once hopping to flip the contract prior to completion are running short on buyers, as evidenced by condo sales falling to a six year low. This creates a few problems for pre-sale purchasers who have a legal obligation to close upon completion of the building. Completions, which are already at record highs, are expected to ramp up even further in the years ahead with both housing starts, and units under construction at record highs. Apartments under construction Greater Vancouver. In a market of declining values, which makes pre-sale contracts harder to flip, it also creates issues for the buyers who have to close. When mortgage lending tightens, as it is today, buyers may be faced with a smaller mortgage than the one required to pay out the developer. Banks do not lend on the price you paid at the pre-sale centre, but rather, on the bank appraised value at the time of completion. In other words, if the bank thinks your condo is worth less than what you paid for it, tough luck. The shortfall between the price you paid and the bank appraised value will be the buyers responsibility. Now factor in how many pre-sale contracts have been flipped, combined with a burgeoning pipeline of new supply en route, and you can see where things might get messy. 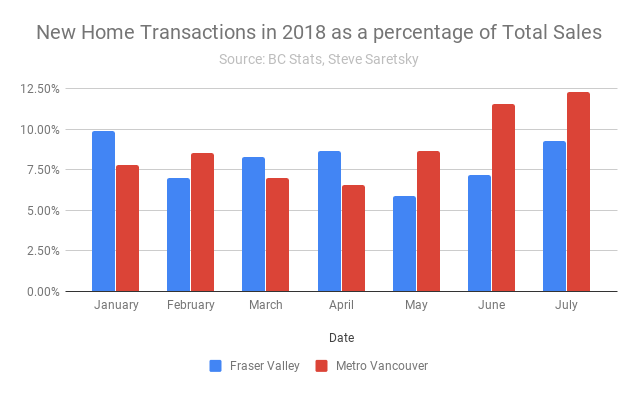 Market stability will be critically important for new construction transactions which made up 12.3% of total transactions in Metro Vancouver as of July 2018. New home transactions as a percentage of total residential transactions. This percentage will surely grow larger as the re-sale market slows and the contractual obligations of pre-sale purchasers sits restlessly at all time highs, many of whom did not intend on crossing the finish line.